UX discothèque: How to DJ design thinking! Using techniques from DJ culture and music performance, we will explore how UX design can be elevated to new dimensions using some tricks from another trade. Having worn both hats, I will talk about empathy, dynamics, and uniqueness in both scenarios and how ultimately, thinking like a DJ may help you build your best product yet. As designers, it's good for us to look across disciplines for creativity. One of the issues we have in contemporary UX design is that we can reference any design and copy it in 0.2 seconds but real differentiation and originality come from mixing different principles into a product's design. How can we design outside of that box? I've been lucky to always have a cross disciplinary approach in design due to my background in music, design, and programming. Also working in a museum for years has taught me quite a bit about creating dynamics and space within designs for a wide variety of visitors. In this webcast, we'll explore how we can take principles that musicians have used to create emotional rises and falls and apply that to UX thinking and practice. We'll explore a different way to think about design. Designers will find inspiration from other disciplines, including music and beyond. 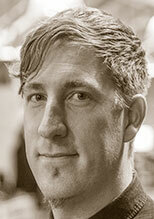 Jim Forrest is the Director of Design at Intrepid - a mobile design and development firm located in Cambridge, MA. He has plenty of experience with creative direction, design, and user-experience. Previously, Jim was an award-winning Creative Director at the Peabody Essex Museum. His work has been included in many presentations and articles. Jim is a composer, educator, museum veteran, and synth fanatic.